I love historical fiction, I always have and when you combine that love of history with a bit of paranormal woo hoo you truly have one fun story that every bit as hard to put down as it was fascinating. Told in an era of time where spiritualists were seriously becoming popular and just about anything seemed to go, this was a fun tale that not only brought a touch of history to it but was completely entertaining as well with a slight edge of romance and a mystery that will keep you guessing until the end. This was a great read that was just what I was hoping it would be and left me wanting the next book. I think this will be a really fun series that everyone will love. Yep, I love the realism mixed in with the "other". I like historical and love the idea of it mixed with paranormal. Glad you enjoyed it. Great review! It's a really fun mix. Thanks for the review, Ali. Sounds like a great historical novel with the right amount of paranormal laced into it. Thanks for putting this in front of me Kindlemom. I too love altered/paranormal historical fiction. I'm putting this on my wish list! *high fives you* Hope you love it! I bet you will like it. It was a nice read that kept me turning the pages. I mm glad to see you enjoyed this I have it on my curious list. I do love a little historical mystery! I love the sound of this one. I don't read enough historical romance but with a bit of paranormal it take a turn for something I would definitely enjoy! The cover reminds me of the Gail Carriger books. Great review. Yes, I thought that too when I first saw it! I really enjoy historical fiction with a touch of paranormal. I feel like I haven't read enough of it though. This one definitely sounds great and it's on my to read list. Your review has made me even more curious now! I really like that cover too. It was fun so I do hope you try it and I agree, the cover is so pretty! Great review! This one is totally new to me but I love that cover and the sound of this! I really like how this book has a little everything for every reader-romance, mystery, historical fiction, and even paranormal. Sounds like a fun read! The genre blending is very nice and it was well done too which is always a huge bonus for me. I liked your review. Sounds an interesting book series! I rarely read historical, but this one sort of reminds me of Cat Winters, which is a very, very good thing. It is a bit like her work with the touch of other to it. Hopefully it is something that you both can get into together. ;) Some are way better than others so find a good one!! Sounds like a great start to a new series! I do want to read more historical fiction. This is not a "my cup of tea," kind of read but it sounds kind of interesting. Glad you liked it! Oh this one sounds interesting! I'll have to check it out. I've had my eye on this every time I see the cover and now I'm even more curious because of the tpuch of paranormal aspect. Glad you enjoyed this new series. Thanks Kim, I hope your's is great too! Ooo I love historical with a little woowoo. That cover is lovely too! I love most types of paranormal and this sounds like it has that and a bit extra. This looks like my type of read. 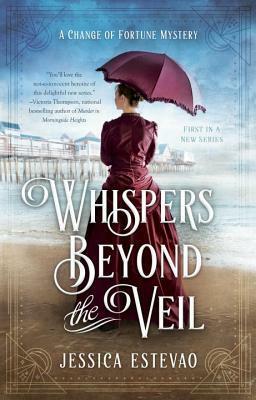 I love historical fiction with a sprinkling of paranormal. It is real funny that I love history, but not a huge fan of historicals. I think maybe it might have to do with the fact that I've only tried historical romance. Maybe if I tried a different type of historical, I might like it better. I do love paranormal. I'm really glad you enjoyed this one. The romance is pretty nonexistent in this so you might like it more, it focuses more on her life, abilities and of course the deaths. I love historical fiction as well. I would totally read this one. Of course, thanks for stopping by and checking it out Lorna!